You are here: Home » MEDIA » Books » Ancillary Mercy (book 3) by Ann Leckie (book review). Ancillary Mercy (book 3) by Ann Leckie (book review). The hype over Anne Leckie’s ‘Ancillary’ books is not exaggerated. The judges and nominators of all of the various awards were all correct. 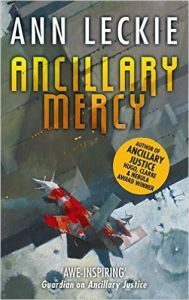 I was blown away by ‘Ancillary Justice’ and equally impressed by ‘Ancillary Sword’, so I already knew I was going to love the third volume, ‘Ancillary Mercy’, before I started reading it. If anything, it exceeded expectations. The wonderfully original setting and the ancient and elaborate traditions transported me back into Ann Leckie’s world within the first paragraph. The clever way of managing an omnipotent viewpoint is still highly impressive. There is also an unexpected dose of humour in Translator Zeiat, whose incomprehension at everyday conversation and fixation on fish sauce led to several moments of me laughing out loud as I read. This volume continues almost straight away from the conclusion of ‘Ancillary Sword’, with Fleet Captain Breq, formerly the troop carrier Justice of Torren, attempting to manage the delicate situation on Athoek Station. Life becomes more complex with the arrival of various new characters and parties but, unlike some other sequels where entirely new factions are introduced in order to progress the story, all of the developments in this volume are continuations of situations that were brewing in the previous book. Breq is a fabulous viewpoint character having, as she does, numerous viewpoints to choose from. With her implants linked to the spaceship, Mercy of Kalr, that she is now captain of, she is able to tie into all of the ship’s feeds, both on board and via the implants of its crew. Ann Leckie does a masterful job of tying all of these strands together so that we can follow the entire story through different characters viewpoints without suffering from the usual jarring effect of POV shift. As well as the POV following the important action, we are treated to numerous snippets of background goings-on: crew making tea, gossiping, singing, carrying out mundane chores. All of these are familiar and comforting to Breq and provide the same feeling for the reader, giving us far more insight into characters and customs than we might otherwise achieve without a lot of info-dumping. Breq also develops as a character, struggling still with her isolation as a single ancillary that was once part of Justice of Torren while gradually coming to understand the humans and AIs around her. Her stoic crew several times brought about moving moments as they prove their loyalty to their captain through such simple acts as their choice of tea service. The whole tea ritual and tradition flows throughout all three books and takes on immense significance as you come to understand it. I can’t praise this book enough. The clever way it handles gender equality through gender-neutral language and an AI who can’t really distinguish between different types of humans. The aforementioned multi-stranded point of view, the well-thought-out and original empire and its customs and traditions all make this one of the most original and captivating books I have read. Ancillary Justice by Ann Leckie (book review).